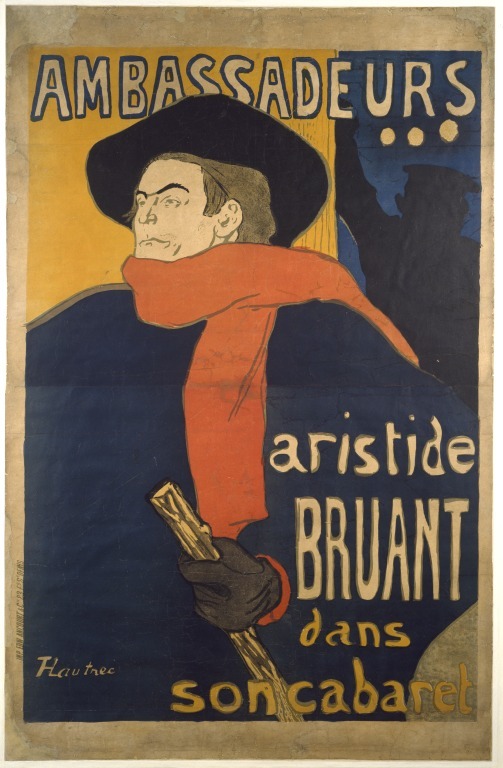 This poster advertises an event with the singer Aristide Bruant at the Ambassadeurs nightclub in Paris, 1892. Bruant, a satirical singer and a friend of the French artist Henri de Toulouse-Lautrec (1864-1901), insisted that Lautrec design this poster. The director of the Ambassadeurs disliked its dramatic and uncompromising style, but since Bruant said he would not perform unless the poster remained, it was used both outside the theatre and inside to decorate the proscenium arch. Poster advertising an event with the singer Aristide Bruant at the Ambassadeurs nightclub in Paris, 1892. 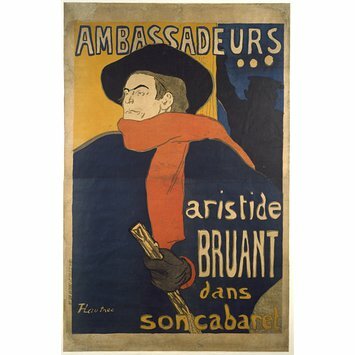 Poster, 'Ambassadeurs... Aristide Bruant dans son cabaret', Henri de Toulouse-Lautrec, French; 1892.